This amphora has a slender profile. The narrow neck extends downwards into a sloping shoulder before joining the belly with its gently rounded sides and conical-shaped bottom, while the top of the cylindrical neck swells slightly outwards. The neck opens into a straight, flat-lipped mouth. Two symmetrical ear-like handles are provided half way up the body. The surface between the base of the shoulder and the handles is deeply indented with a corded decoration of fine, parallel, oblique grooves. This stamped motif was probably executed using a ceramic die, or by means of a wooden roller that either had grooves carved into it or was wrapped in cord. The amphora was shaped from a single lump of clay then smoothed inside and out. The corded decoration partially stripped away the outer layer and after firing this gave the decorated area a rougher, mat aspect and pinkish tint that contrasted with the remaining smooth, orange tinted surface. The rough surface made the object easy to grasp. A strap, attached around the neck and through the handles, enabled water to be drawn from the river and made transport easier. Characteristic of the Banpo period, the pointed-bottom amphora spread from the Wei valley (Central Shaanxi and Eastern Gansu) throughout a wide area including Henan, Shanxi, Northern Shaanxi, Hebei and Inner Mongolia, and continued into the Majiayoculture (3800-2300 BCE). 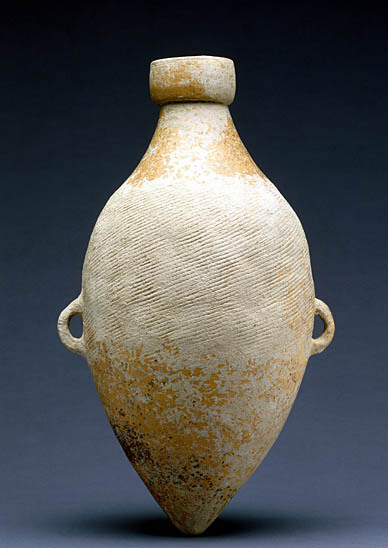 This utilitarian object is one of the many recipients designed to hold liquids that represent a notable development in relation to the previous Laoguantai culture (5900-5000 BCE). They illustrate the increased use of water in a village-based society carrying out various activities, including agriculture.